In this historic moment, philanthropic leaders are ready to explore and create a rich variety of approaches to values-aligned philanthropic practice that will bring about true equity and justice. The Resonance Framework is designed to intensify and enrich values-aligned philanthropic practices to bring about a Just Transition  in philanthropy. The erosion of public benefits, threats to organized labor and the proliferation of a contingent workforce – along with issues of income inequality, displacement and gentrification, mass incarceration of Black and Brown people and ecological degradation – all indicate a need for massive systems change. Collectively, these crises necessitate that we each take responsibility for doing our work more effectively and with greater impact. Given the scale and frequency at which human-made and natural crises are accelerating, incremental approaches are not sufficient to manifest the changes we seek. We must take bold and transformative actions to advance exponential change and forge a new path that will allow future generations to thrive. Over the past decade, we have seen some of the most dynamic movement  organizing in recent history that has united communities working to build a society that works for all: Occupy Wall Street, Spain’s Indignados, Arab Spring, #BlackLivesMatter, Standing Rock, the Fight for $15 and more. Most recently, the 2016 U.S. presidential election has ignited a surge of resistance organizing that has brought together unlikely allies against a common opposition. This wave of social movements has demonstrated the power of intersectional approaches grounded in shared values to facilitate the wide-scale systemic change our world needs. 4. Throughout this document, our use of “movement” refers to mass-based social movements led by and for our society’s most marginalized communities. From Banks and Tanks to Cooperation and Caring: A Strategic Framework for a Just Transition. Movement Generation, 2016. We are clear that we need a Just Transition – like the one that the Climate Justice Alliance, Movement Generation and other frontline and movement visionaries have been working to nurture and accelerate. 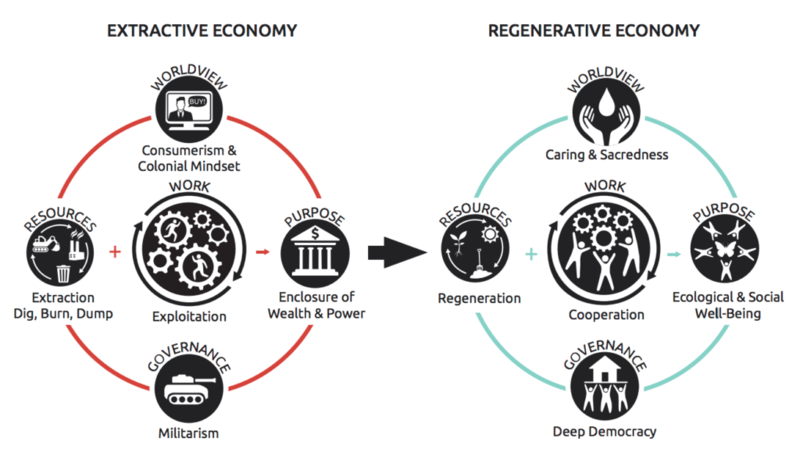 In essence, this means a transition away from an extractive economy (based on the accumulation, concentration and enclosure of wealth and power) towards a more regenerative economy (based on reflective, responsive, reciprocal relationships of interdependence between human communities and the living world). What is philanthropy’s role? Funders who are concerned with social justice are clear that grantmaking dollars alone are not enough to manifest the kind of transformation needed to dismantle the multiple systems of oppression that keep our communities and our planet from thriving. So what changes must we make within ourselves and our institutions, and in the laws that administer this field, in order to facilitate a Just Transition for philanthropy? We believe that it begins with a new vision of philanthropy: one that takes an active role in building a thriving and just world by redistributing wealth, democratizing power and shifting economic control to communities. With this new vision, we can build a world that honors the sacredness of our natural resources and recognizes the inalienable rights of all. When we think about the transition from a system organized around limitless extraction and wealth accumulation to one organized around regeneration and resilience within natural limits, philanthropy can play a transformative and catalytic role. This is because philanthropic wealth, while it is a small fraction of the accumulated wealth within our overall economy, is managed by individuals within the world of wealth management who are most aligned with social justice values. As philanthropy embraces a Just Transition, it can influence other aspects of our economy including public capital (i.e. government, budget and tax policy), which will encourage private capital to follow its lead. We invite you to join us on a journey towards this vision. In the following pages, we share a new framework for understanding how institutional philanthropy has been constructed over the last century, how it has been constrained from achieving its full potential, and how we can collectively take our first steps towards philanthropic transformation. Next Section: How Did We Get Here?